"To many, the church's great memorial tower seemed incomplete so long as the bell chamber remained empty. Fr. Blunt was eager to have something done about it and dropped a hint to that effect in one of his sermons. As a rule, when the Rector made one of his gentle suggestions, somebody did something about it. The seed, this time also, fell on fertile soil, but it was several weeks before there were any signs of a harvest. One day, however, as he was calling on a parishioner, Mrs. Janet Bartlett Talmadge, a widow who was having a struggle to earn a livelihood for her three children and herself, she suddenly said, 'After hearing your sermon last October, I got to thinking how wonderful it would be if we could get some chimes for All Saints', so I began to save my pennies. If I found one in my pocket-book, I put it into a bag, and I want you to take them today as a start for the bell-fund.' There were 1059 pennies in the bag. At once the idea was seized upon and everyone was urged to save pennies, which could be contributed the first Sunday in each month and blessed with the regular offering." 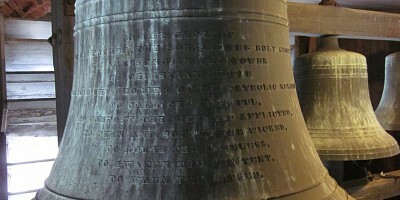 In the end, the Parish collected 509,613 pennies–about half the cost of the bells; the remainder of the funds needed were raised through other contributions. 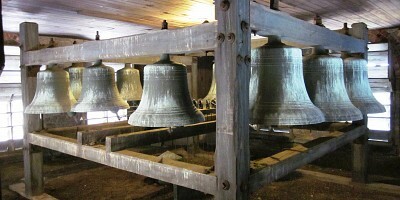 The Parish placed an order for eleven bells with the McShane Bell Foundry of Baltimore, MD. 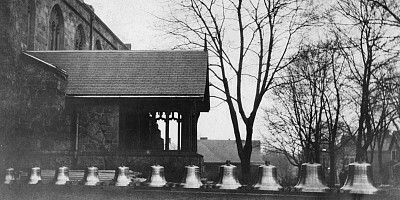 On March 22, 1923, the bells, arranged on the church lawn, were blessed by the Rector. They were hung in the tower bell chamber in time to be rung for the first time that Easter, on March 31, 1923. The bells are fixed on a heavy timber frame in the top-most chamber of the tower and do not move when rung. 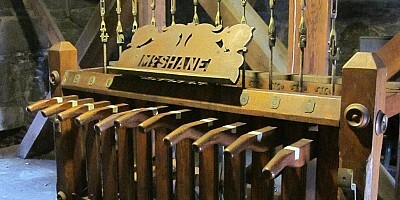 Instead, their clappers are connected via cables to a playing stand in a chamber one story below, where chimers push down wooden handles attached to the cables to strike the bells. This is a fully mechanical, hand-powered system, and no electricity is used to make the bells sound. The bells are played occasionally after the 10:00AM Mass on Sundays and on special feast days and other occasions throughout the year. Photos: Jeffrey Gonyeau; parish archive.